So you just got engaged. Congratulations! Before you get started on your budget and venue (admit it, you've had the dress picked out for years), you need to organize your support system -- because you're going to need it now more than ever. Of course, we're referring to the team of women who have stood by your side through everything from breakouts to breakups. It's time to think about how you're going to propose to your bridesmaids-to-be. And if you're wondering...yes, bridesmaid proposals are now commonplace and thus very involved. Welcome to the wonderful world of wedding planning. We completely understand why asking someone to be your bridesmaid is a big deal. They'll be subjecting themselves to a year of chaos and frequent late night phone calls. But it also comes with mani/pedi dates and wedding planning dinner dates. 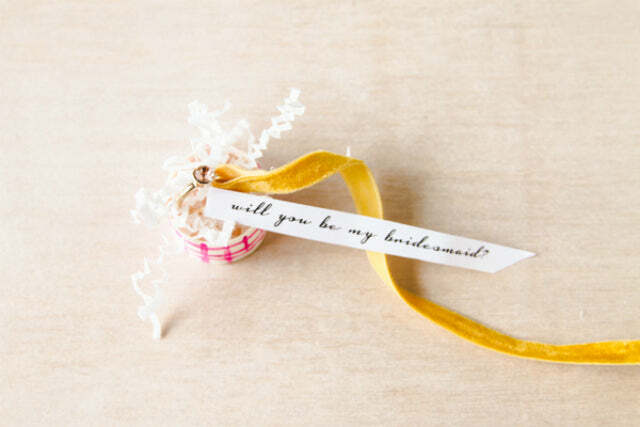 We read a few endearing stories and have seen a few good bridesmaid proposal DIY projects, so we're sharing some of our favorites with you today. 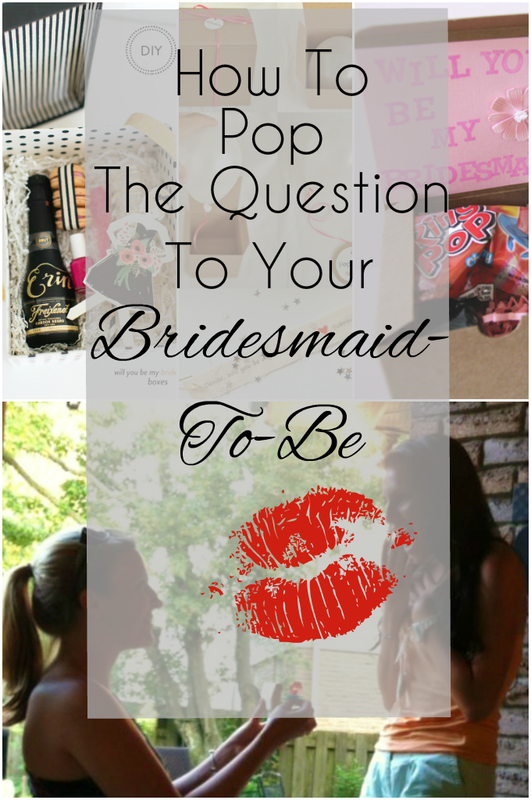 We'd love to hear some of your stories about how you asked your bridesmaids! 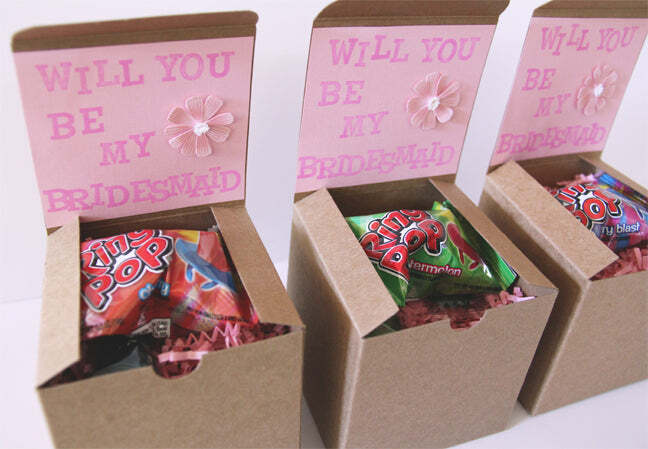 Bridesmaid boxes can range from a jewelry box full of "wedding necessities" like a shot glass and lip balm to a box of a bridesmaid-to-be's favorite sweets and snacks. It all depends on the relationship between you and your bridesmaid. Most, if not all, bridesmaid boxes include some kind of indication of the colors of the wedding, as well as the date. Below are two really great examples of bridesmaid boxes, executed in different ways. Sobrina from Quiet Like Horses got this balloon in a box from the Party Posse. 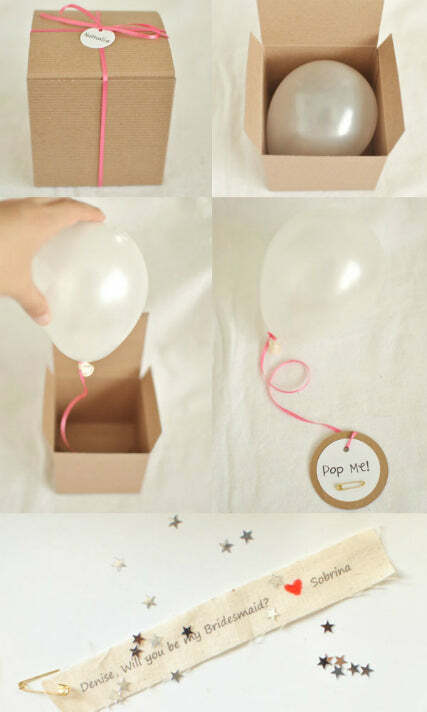 The balloon, already blown up inside of the box, has a message attached to it that says, "Pop Me!" When you pop the balloon, silver confetti stars pop out as well. Inside of the balloon is a small message that says, "Will you be my bridesmaid?" Sobrina put her own personal touch on the proposal box by adding a pink peony, a nod to her wedding colors. 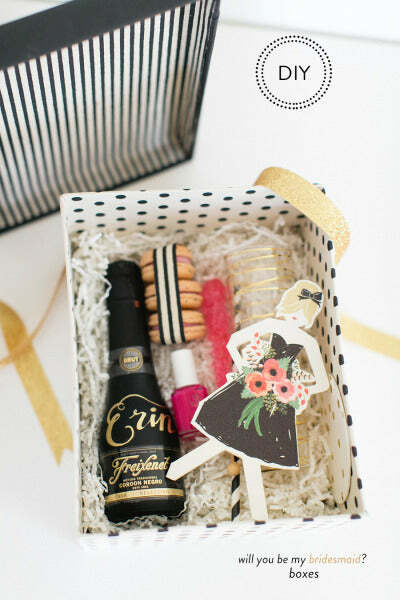 We also really love this DIY Bridesmaid Box by Style Me Pretty. They included some mini cava bottles, personalized with the name of each bridesmaid. The box included the cava, straws, gold glasses, rock candy, nail polish, macarons, and a paper bridesmaid invitation. By looking at this box, we're assuming that the wedding colors are black, gold, and pink and we love it. Want to really make your bridesmaid feel special? Get down on one knee and show her that you're ready to commit, if she is. It might sound a little crazy, but if you want to get an unforgettable reaction, this is the way to go. Some brides choose to use a Ring Pop tucked away in a fancy ring box, while others just ask the question with a flower. From what we've read on wedding blogs and forums, getting down on one knee to propose to your future bridesmaid will have a big effect on your girlfriends. Perhaps the process reminds them of how it will feel when their significant other proposes to them. Some people, like Ali from The Sorority Secrets, turn the Ring Pop into a DIY project. Project Wedding made some mini proposal boxes using tiny craft boxes and a tiny decorative scroll attached to a bridesmaid engagement ring. They even managed to fit some crinkle paper in those little boxes. Project Wedding recommends customizing the proposals by painting the boxes the main color of your wedding and then using a ribbon with the secondary color. Life has taken you and your closest girlfriends to different places of the world, so you might not be able to propose to them in person. But that doesn't mean that you can't make them feel just as special with a heartfelt card. There's no way you could pull off what Kim Kardashian did with her baby shower invitations, but you can get close if you peruse Etsy long enough. 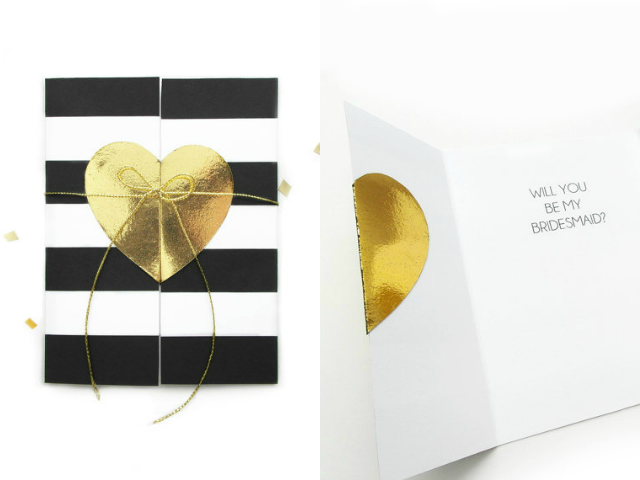 There are plenty of cute bridesmaid proposal cards on Etsy. This one from Hello Love Press has a "peekaboo" design and features a string opening. Your girlfriends will be thrilled when they open it. After all, who even sends cards anymore? It's a sweet surprise. 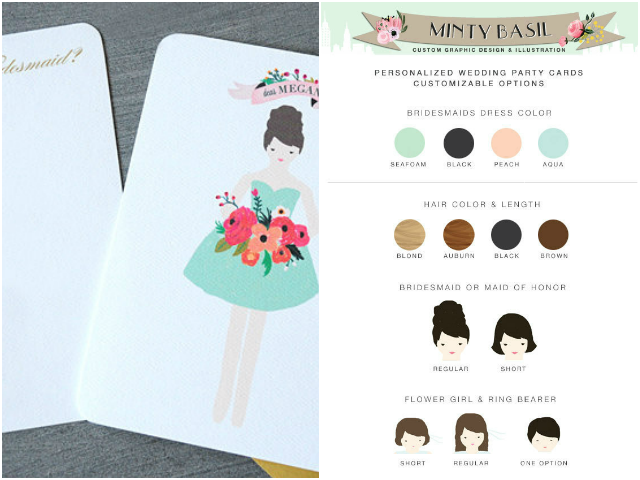 Most of the "Be My Bridesmaid" cards you'll find on Etsy can be customized, like this one from Etsy shop Minty Basil Designs. You can customize the bridesmaids and maid of honor with different hair styles, colors, and outfits. 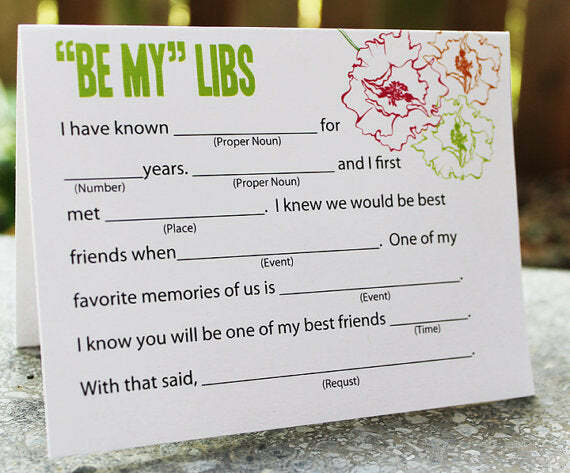 If you have a particular friend who's stuck by you through some of the strangest, funniest, scariest moments of your life, this Mad Libs bridesmaid proposal would be perfect. They can fill in the spaces with your memories. Your bridesmaids-to-be are the friends and family members who have been there for you on certain nights until the wee hours of the morning. Maybe those nights started with a bottle of wine. You've lamented, conspired, and dreamed together, so ask them to be your bridesmaids and have each bridesmaid bring their bottle to different wedding functions throughout the planning process. 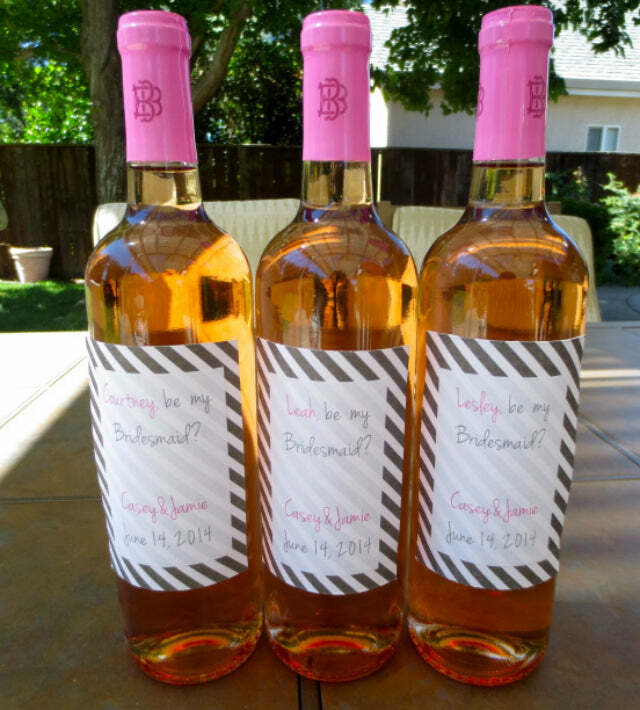 Jamie from House Wife Problem made these custom "Will You Be My Bridesmaid" wine bottles for her girlfriends. In the tutorial, Jamie also gives you a helpful trick for getting the sticky label off so the wine bottle is nice and clean for your new label! Check it out here. How adorable are these wine glasses? 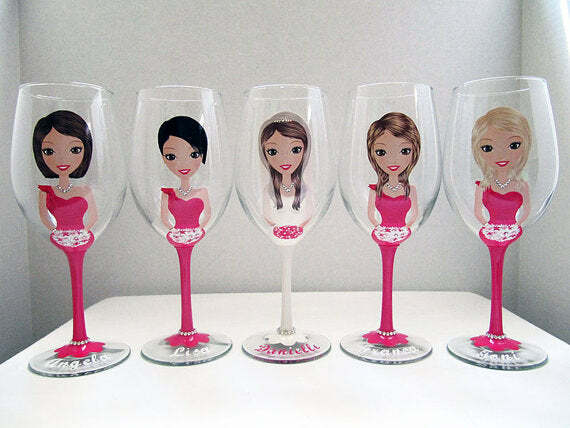 If you really want to go the extra mile for your bridesmaids-to-be, get them some of these cute character wine glasses. Get in touch with Jenny D from Jenny D's Creations and she'll customize these glasses to fit each of your bridesmaids. She'll even add their names and the wedding date at the base of the glass. Genius! Check them out here.